The western hooded pitta belongs to the family of pittas, Pittidae. The western hooded pitta species are distributed in India, Nepal, Bhutan, Bangladesh, southeast Asia and China. These pitta species are green birds with black head and chestnut crown. These pittas are polytypic species. The western hooded pitta is a small bird, measuring 15 to 20 cm in length and weighing 40 to 80 grams. There is slight variation in the plumage coloration among the western hooded pitta subspecies. The nominate subspecies is a green bird. The crown is chestnut or rufous. The rest of the head, nape, chin and throat are black. The upperparts including the wings are dark green. The uppertail is blackish. There is a large pale greenish-blue glossy patch on the side of the folded wings. The breast and the upper belly are pale green. The lower belly, vent region and undertail are red. The western hooded pitta bill is large and glossy black. The eye is surrounded by a black eye ring. The irises are black. The feet are pale grayish pink. The juvenile western hooded pitta have duller plumage. The upperparts in juveniles are dull green and the underparts are dull grayish green. Their call consists of fluty double-noted whistling "qweek..qweeek" sound. 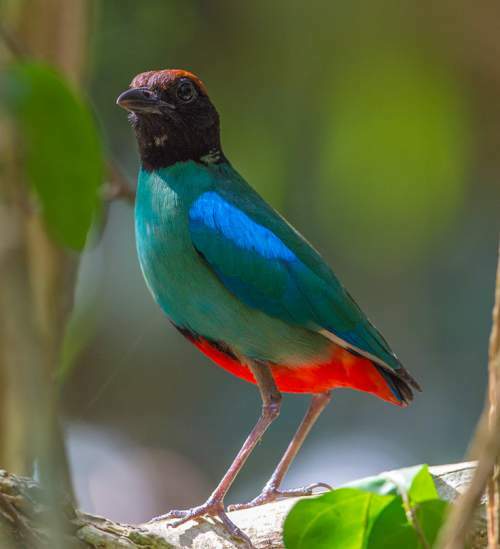 These western hooded pitta species are distributed in India, Nepal, Bhutan, Bangladesh, Myanmar, Thailand, Cambodia, Laos, Vietnam, Malaysia, Singapore, Brunei, Indonesia, Philippines and south China. In India, these western hooded pittas are distributed in the states of Himachal Pradesh, Punjab, Haryana, Uttarakhand, Uttar Pradesh, Bihar, Sikkim, West Bengal, Assam, Meghalaya, Arunachal Pradesh, Nagaland, Manipur, Tripura and Mizoram. In China, these western hooded pitta species are distributed in the province of northwest Yunnan. The western hooded pitta nominate subspecies P. s. sordida is distributed in Philippine Islands. The subspecies P. s. abbotti is distributed in Nicobar Island (India). The subspecies P. s. forsteni is found on north Sulawesi Island (Indonesia). 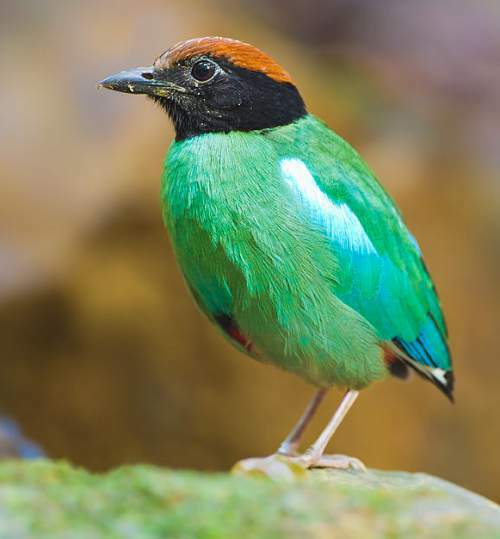 The western hooded pitta subspecies P. s. cucullata is distributed in north India, Nepal, Bhutan, Bangladesh, northeast India, south China, Myanmar, north and central Thailand, north Laos and north Vietnam and Cambodia. The western hooded pitta subspecies P. s. sanghirana is distributed in Sangihe Islands (Indonesia). The subspecies P. s. palawanensis is distributed in west Philippines. The subspecies P. s. bangkana is found on Bangka Belitung Islands. 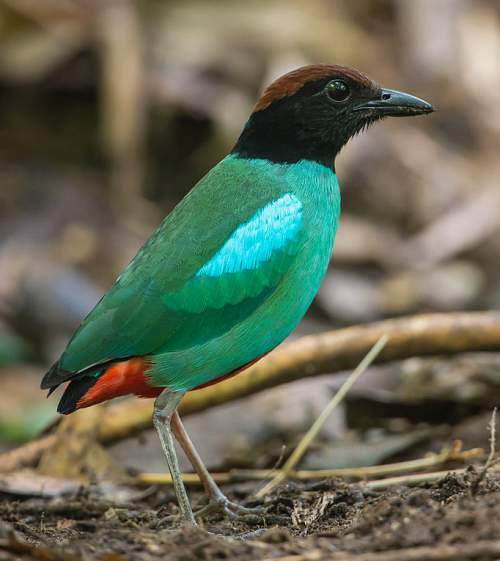 The western hooded pitta subspecies P. s. mulleri is distributed in south Thailand, peninsular Malaysia, Singapore, Borneo (Malaysia, Brunei, Indonesia), southwest Indonesia (Sumatra and west Java) and west Sulu Islands (Philippines). These western hooded pitta species have moderate forest dependence. These species normally occur in altitudes from 0 to 2000 meters. The artificial ecosystems and habitats of these species include agricultural fields, plantations, orchards, rural gardens and urban parks. The natural ecosystems of these western hooded pitta species include tropical and subtropical moist lowland forests, moist montane forests, primary riverine forests, dry deciduous forests, mangroves, dry shrublands and marshes. The diet of western hooded pitta consists mainly of insects. Small invertebrates, beetles, cicadas, crickets, grasshoppers, ants, insect larvae, moths, termites and spiders are their primary food. These species forage on the ground for insects and insect larvae. They can glean insects from the plant branches closer to the ground. The also occasionally feed on berries and plant matter. The breeding season of the western hooded pitta species is from April to August in India. The laying season in mainland southeast Asia is from May to October. The breeding season in Indonesian islands is from December to May. These western hooded pitta species are monogamous. They are strongly territorial and are very aggressive in protecting their nests. Their nesting sites are domed ground scrapes lined with dry plant matter. The clutch usually consists of three to five ovoid whitish eggs. Both the parents take turns to incubate the eggs for about 14-18 days. The chicks are entirely altricial and both the parents take care of the hatchlings. The nestlings fledge in about 25 to 30 days. These western hooded pitta species are partially migratory birds. The birds in higher elevations come down to lower levels and plains during winter. Part of the population of the western hooded pitta subspecies P. s. cucullata migrate southwards to Sumatra and Java for wintering. The rest of the seven subspecies are resident birds. Post breeding, the juveniles of the resident populations may disperse and establish in new locations within the range. They may make local movements for feeding and breeding within their range. The global population size of the western hooded pitta has not been quantified. The overall population trend of these species is reported to be decreasing. Throughout its range this species is reported to be common to rare. The generation length is 4.2 years. Its distribution size is about 12,300,000 sq.km. Deforestation, degradation and fragmentation of habitats and trapping for caged bird trade are the main threats that may endanger the survival of these species. The western hooded pitta does not approach the thresholds for being Vulnerable either under the range size criterion or under the population trend criterion, or under the population size criterion. The CITES (Convention on International Trade in Endangered Species of Wild Fauna and Flora) status is ‘Not Evaluated’ for western hooded pitta. The western hooded pitta is closely related to P. novaeguineae and P. rosenbergii. The eight recognized subspecies are: P. s. sordida (Statius Müller, 1776), P. s. forsteni (Bonaparte, 1850), P. s. sanghirana Schlegel, 1866, P. s. palawanensis Parkes, 1960, P. s. bangkana Schlegel, 1863, P. s. mulleri (Bonaparte, 1850), P. s. abbotti Richmond, 1902 and P. s. cucullata Hartlaub, 1843. Current topic in Birds of India: Western hooded pitta - Pitta sordida.